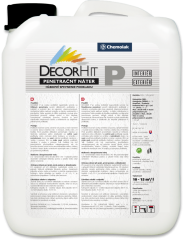 is a waterborne impregnant designed for indepth penetration of absorbic silicate surfaces in interior and exterior such as limy, limecement, cement or render and high-build coating, plasterboard and porous-concrete. The coating penetrates deep into the surface, increates its surface firmness, decreates absorbency and so improves uniform surface coloration. Impregnant is used prior to dispersion paint application and application of plasters to improve adhesion to the surface.